A community activist, Mrs Lillian Mwintomee Kuutiero, has described the idea of opening up spaces for contest at the district level to political parties as “a beautiful concept”. She said it would be beautiful for district officials to compete to be elected to develop communities. Mrs Kuutiero, was speaking as part of 60 participants in a training of trainers’ workshop on local governance reforms and constitutional amendment. 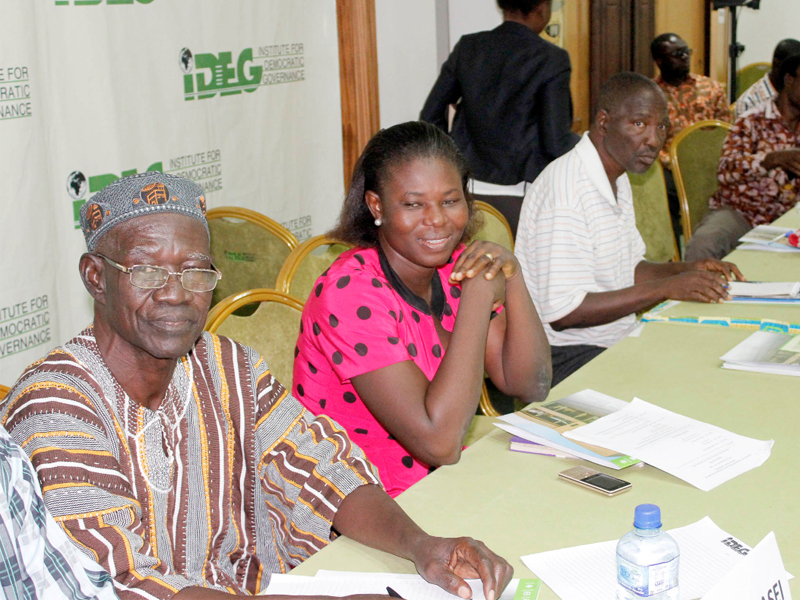 She was sharing her views at the two-day meeting in Accra organised by the Institute of Democratic Governance (IDEG). “It will breed healthy competition in the district assemblies, as elected officials working hard to develop Nandom, for example, will serve as a yardstick for officials elected at Nadowli and vice versa,” she added. Participants were drawn from faith and community-based organisations, women and youth groups, as well as teachers and community activists. Other participants were from IDEG’s Governance Issues Forum Network (GIFNET), a network of community actors engaged in local governance issues. A Senior Research Fellow at IDEG, Mr Kwesi Jonah, in his presentation on how political parties could adjust to the proposed reforms, said although the President and other candidates during the election had promised that representatives at the local authorities level would be elected, the President had gone further to state at an orientation of Metropolitan, Municipal and District Chief Executives (MMDCEs) in July this year that they would be elected along party lines. That, for him, was promising and although a decision was yet to be taken on the election of assembly members, it was likely they would also be elected, he added. A Senior Research Fellow of IDEG, Professor Atsu Ayee, in his presentation on the implications of the President’s decision to elect district chief executives (DCEs), stated that some provisions of the 1992 Constitution had to be amended for the reforms. Among the provisions to be amended was Article 55, which banned political parties from participating at the local level and contradicted provisions in the Directive Principles of State policy in Chapter 6, Article 35 (6)(d), which enjoined the state to make democracy a reality by ensuring the participation of all Ghanaians. Prof. Ayee said that was an entrenched provision that would require a referendum. He challenged participants to have a clarity of the issues at stake and a timetable in mind as they went out sensitising Ghanaians to a forthcoming referendum for the required change. While the Executive Director of IDEG, Dr Emmanuel Akwetey, took participants through the need for the reforms, a Senior Research Officer, Mr Edward Garr, took participants through IDEG’s advocacy so far. IDEG proposed the multi-party governance reforms in 2010 in response to the divisive politics and tension of elections. The proposals include democratic devolution of executive power, the strengthening of political parties to become developmental organisations and the strengthening of public administration bureaucracies into modern state institutions.